The Wildcats lost for the fourth time in a row after they were edged by USC in a track meet at the LA Coliseum, 48-41. After trailing 17-0 after the first quarter, the Cats got things going against the Trojans and drew within a TD in the 3rd and 4th quarters of the game. In the end, the Cats couldn't stop the Trojan offense as Matt Barkley passed for 468 yards and Robert Woods caught 14 catches for 255 yards. 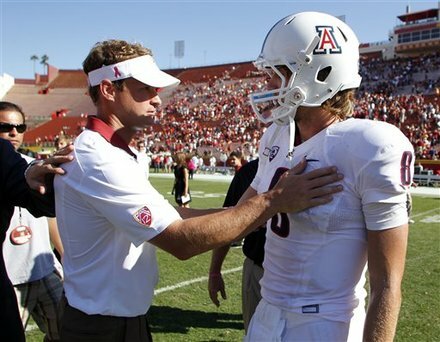 Arizona never forced a punt the entire game as their defensive woes continued this season. The offense on the other hand, played well after being shut down in the first quarter. Foles passed for 425 and 4 TDs after throwing two INTs early in the game, his first of the season. Ka'Deem Carey contributed by scoring 3 TDs. Offensively, the Cats should not be discouraged, but the defense was nonexistent. If they can score 41 points against the rest of the teams on their schedule, regardless of their defense, they should be able to squeak away with at least 5 wins.